Smartphones are becoming a prime target for hackers, the valuable data they contain and their vulnerability encourage hackers to focus their attacks on these devices. These hackers are intelligent and highly resourced so they can exploit weaknesses in the mobile platforms, operating systems and applications. Research suggests that half of mobile users will not take any steps to protect their devices, even when aware of the risks; and so-called operating system defences are easily broken down. 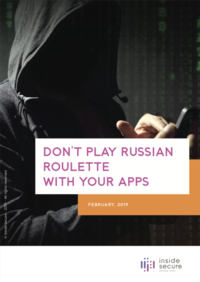 Mobile application developers need to be aware of this; and have to assume that the devices their applications are running on have been - or will be - compromised. This means that developers need to take responsibility of making their applications protect themselves. If developers do not take responsibility, the $124 billion spent globally on IT security could be rendered futile by weak mobile apps.